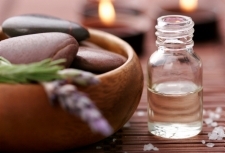 For thousands of years massage using essential oils has been used to help with a wide range of illnesses. Many different cultures have developed treatments using oils extracted in a number of ways to obtain a fragrant healing essence. Conventional medicine uses forms of aromatherapy oils, herbs, roots and plants from all over the world, but the manufacture of these medicines has lost the more natural part of these and ended up with its chemical cousins! But it is true that many conventional medicines are based on old herbal remedies. Essential oils are powerful and should be only used in the hands of a fully qualified practitioner. Tiny amounts of these essences enter the body via the skin where they are mixed with a carrier oil and massaged into the skin in a relaxing and theraputic way and also via the nose when the aroma is detected by the sensory nerves in the nose and arrive in the system from there. Allow 90 minutes for the first treatment to include a consultation and subsequent treatments take 75 minutes. Treatment is followed by a break before you leave the salon in the lounge with a glass of water to help with removal of any toxins which may have been disturbed during your Aromatherapy Session.